Look at the two cushions from a distance and they look exactly the same. Look at them from directly in front and they are very different. What you see varies according to the light and where you are standing. 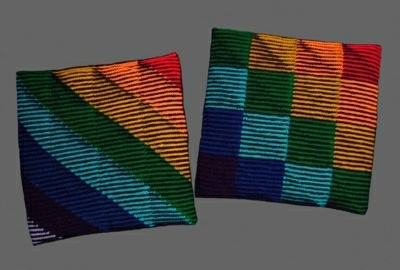 The cushions on the left use 7 or 8 colours, plus the background colour. 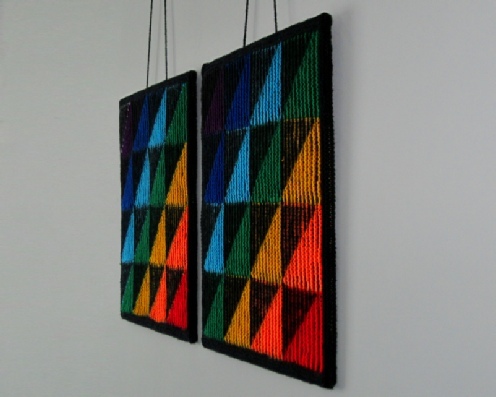 Those on the right have two alternating colours. 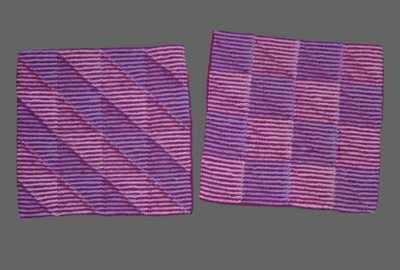 The designs can be seen best when they are completely flat. The covers in the photo on the left are flat and show only triangles. Those on the right are slightly distorted by the cushion pads so you see parts of the blue and turquoise stripes and squares. We later took the covers apart, gave them a navy blue frame and mounted them on boards so they are always seen flat.